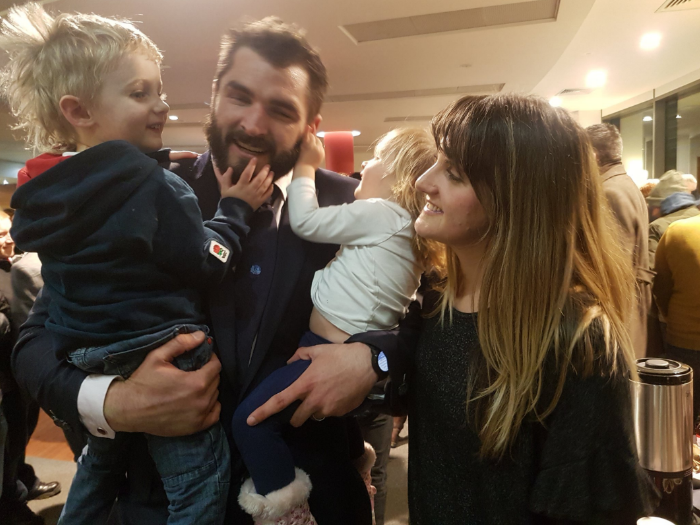 Don (pictured here with his wife and children) also became a snow hero hours after playing for England at Twickenham. After the 29-year-old’s substitute performance for England’s Six Nations match, Don then returned to Exeter to help people to and from the RD&E hospital in the blizzard-reminiscent weather that Sunday. 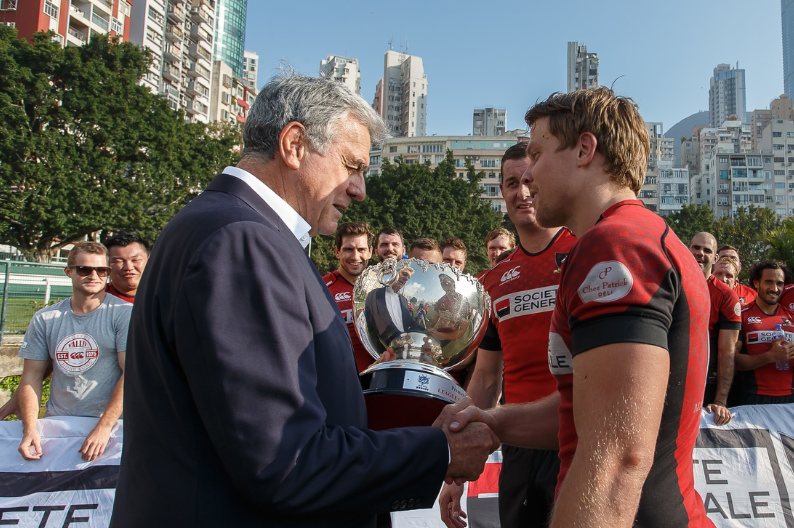 South Africa’s Dylan Sage capped off a very successful tournament and was included in the Dream Team following the conclusion of the Canada Sevens in Vancouver. He was the standout South African player and continues to improve both on attack and on defence. The Blitzboks finished third at the tournament after defeating the USA 29-7 in the Bronze final. 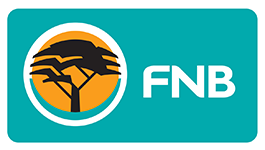 In the Cup quarter-finals, the Springbok Sevens side spectacularly came from 19-0 down to beat Australia 24-19, with Sage scoring the winning try after the hooter. 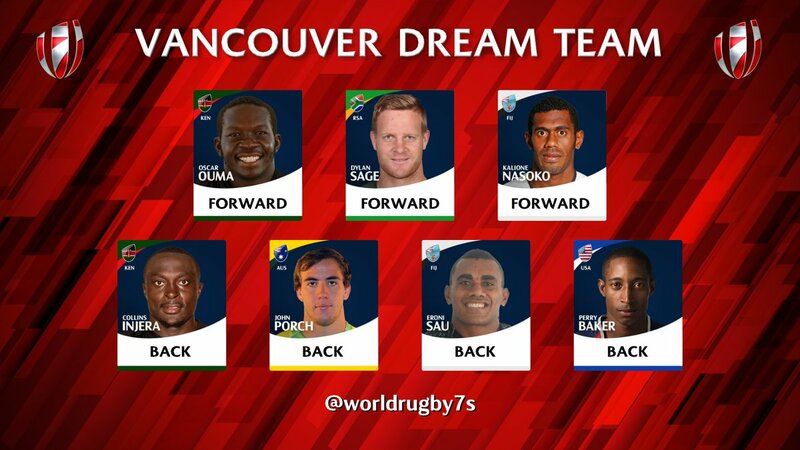 The other players included in the Dream Team were Fijians Kalione Nasoko and Eroni Sau, Kenyans Oscar Ouma and Collins Injera, Australia’s John Porch and USA’s Perry Baker. 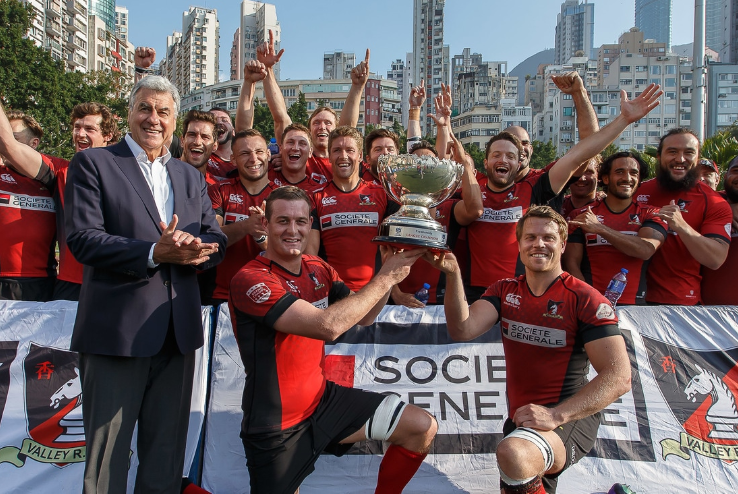 Societe Generale Valley claimed its sixth straight HKRU Men’s Grand Championship title after holding off a furious second half fight back from Borrelli Walsh USRC Tigers to win 22-20 at Kings Park. It was the sixth straight win for Valley in the Grand Final. Ex Ikey and captain of Valley, Martin Muller, said “It was an emotional rollercoaster out there”. “It was sort of the story of our season tonight. We get into games; start well and get a few points then let we them back in. 100% our experience helped us tonight”. “We pride ourselves on not losing matches in March, which we haven’t done for the last five years. We knew we were up against it at the end and we just talked about not over-committing. We know this referee likes to give the attacking team the advantage, so we just had to sit back and let them make a mistake. I think it took 30 phases but eventually it happened”, Muller said. Other Ikeys in the Valley team were Matt Rosslee, Grant Kemp, Tiger Bax and, Dayne Jans. A number of ex Ikeys starred in the Stormers 37 – 20 win over the Auckland Blues. Dillyn Leyds, Damian De Allende, Nizaam Carr, and Siya Kolisi (captain) all started the game and played a large part in the Stormers best performance of the season. Demetri Catrakilis has returned to action at Harlequins after suffering a freak injury last September. Having been the man originally earmarked by the London side as their No. 10, a “freak” accident in only his second match in September caused him to fear he might lose his life. 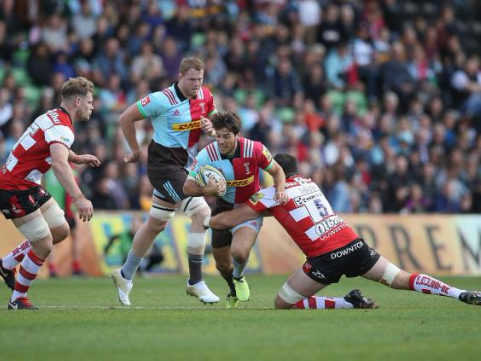 Catrakilis was recruited by Quins as a high-profile signing from top French club Montpellier last summer, with designs on filling the gap left by the retired All Black, Nick Evans, and steering his new club up the Premiership table. 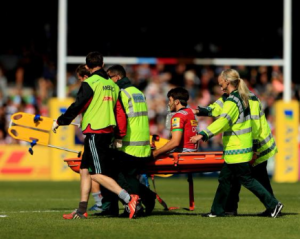 Instead Catrakilis has only just returned to the famous multi-coloured jersey, making his second start of the season in a win over Bath, after spending five months in recuperation from an injury to his throat that he suffered 10 minutes into his first start, against Gloucester last September. The 28-year- old, who has played Top 14 and Super Rugby semi-finals for his previous teams, is thrilled to be playing again while revealing he will never be the same as he was before his accident. 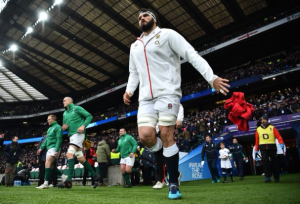 “It was a tackle where unfortunately a shoulder caught my throat, it was just bad timing,” said Catrakilis, of the seemingly routine challenge. “My voice is not the same as what it once was. It’s just not as loud. I think it will stay like this. But it is good enough. I can live a decent life, play rugby – happy days. It could be a lot worse.” In the game against Bath, before being substituted, Catrakilis had kicked seven points and given a tidy display of controlled kicking and varied distribution in the 20-5 victory over Bath. soon again grace the field. Awakening A Dream: Ikeys Partner with VUSA Rugby Ikeys Premier League Kicks Off!